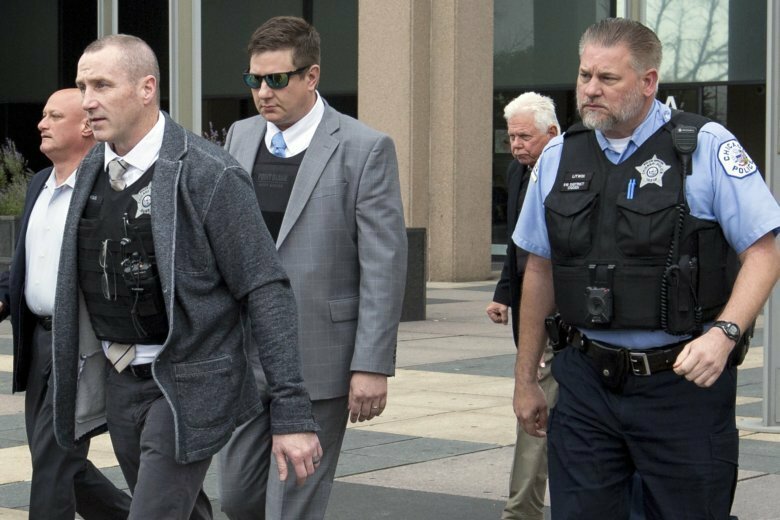 CHICAGO (AP) — A jury is deciding whether white Chicago police officer Jason Van Dyke committed murder and other crimes when he shot Laquan McDonald 16 times as he walked away from officers while carrying a knife on Oct. 20, 2014. They began deliberations Thursday after sitting through three weeks of evidence in the most closely watched trial of a Chicago police officer in decades. By far the most serious charge the 40-year-old faces is first-degree murder. A conviction carries a maximum sentence of life in prison. But, in a move not uncommon at Illinois murder trials, Judge Vincent Gaughan told jurors that they can consider the lesser charge of second-degree murder. If convicted of second-degree murder, Van Dyke could face 15 years or more in prison. Probation isn’t an option for a first-degree murder conviction, but it is with second-degree. Gaughan explained that jurors can’t begin considering second-degree murder until after they decide whether Van Dyke is guilty of first-degree murder. That requires a finding that Van Dyke’s use of deadly force wasn’t justified — that it was both unnecessary and unreasonable. If they find Van Dyke knew that shooting McDonald wasn’t justified and shot him anyway, the first-degree murder conviction would stand. But if they find Van Dyke truly believed the shooting was justified because his life was in jeopardy but that that belief wasn’t reasonable, they can find him guilty of second-degree murder. Van Dyke is also charged with 16 counts of aggravated battery with a firearm. Each count corresponds to each bullet Van Dyke shot into McDonald. Each count carries a maximum 30-year prison sentence. Van Dyke also faces one count of official misconduct accusing him of improperly using his official position as an officer and his department-issued gun to shoot McDonald. It carries a prison term of up to five years. To convict, jurors must find Van Dyke used force without justification. Jurors could come back with a clear, unambiguous verdict: guilty or not guilty on all counts. A messier outcome would be convictions on some counts and acquittals on others. Conviction or acquittal on any charge requires all 12 jurors to agree. Deadlocked juries sometimes seek compromise. Some Van Dyke jurors may not feel evidence supports a murder conviction. One possible compromise would be to acquit him of murder and convict him on everything else. Another conceivable outcome is a hung jury on all or some of the counts. A hung jury would mean prosecutors would have to decide whether to retry Van Dyke on any deadlocked counts. If just one juror holds out for acquittals, that could encourage prosecutors to try again. But if just one juror wants to convict — or even if jurors are evenly split — prosecutors might be dissuaded from a retrial. Federal authorities could step in if there’s a hung jury. There’s no federal murder charge. But Van Dyke could be charged with violating McDonald’s rights by killing him unjustifiably.